I was thrilled to be assigned Confessions of a Cooking Diva, a fabulous blog full of comfort food recipes + amazing-looking desserts – my favorites! I decided to go with something autumn-ish, and make her Apple-Pecan Cheesecake, but with a few changes. I skipped the nuts, since Fearless Baby doesn’t love ’em, + added a rich caramel drizzle instead, because apples + caramel = SO good. I made it in a 9×9 dish (instead of springform pan), opting to make cheesecake bars/squares instead of traditional slices. So, how did they turn out? AMAZING! There’s a buttery graham cracker layer, a divine cinnamon cheesecake layer, + a topping of tender cinnamon-sugar apples + sweet caramel. This is seriously one of the most delicious fall desserts I’ve had – y’all must give it a try soon! Thank you to Julie for introducing me to this incredibly tasty cheesecake + to the Secret Recipe Club for connecting me, yet again, with fantastic bloggers + amazing recipes! For all my previous Secret Recipe Club recipes, click here – there are TONS of awesome ones! And if you love cheesecake bars as much as I do, check out these Cookie Dough Cheesecake Bars, Skinny Chocolate Chip Cheesecake Bars, or Raspberry Swirl Cheesecake Bars – all are SO fantastic. Line a 9×9 baking dish with tin foil with a slight overhang on two sides (which makes for easier removal of the cheesecake). Combine the graham cracker crumbs + melted butter in a small bowl, then press evenly onto the bottom of the 9×9 baking pan/dish. Mix 1 Tbsp. sugar and 1/4 tsp. cinnamon in a bowl; toss with the diced apples + set aside. Beat cream cheese with remaining 1/3 cup sugar and 1/4 tsp. cinnamon with mixer until blended. Add eggs, 1 at a time, mixing on low speed after each just until blended. Pour over the crust. Top cheesecake evenly with the cinnamon-sugar diced apples. Bake for about 40-45 minutes, or until the center is just barely set. Cool for 15 minutes at room temperature, then transfer to the refrigerator + chill for at least 4 hours. Microwave caramels and water in microwaveable bowl on high 45 sec. or until sauce is smooth when stirred. Drizzle over cheesecake. Use foil to lift cheesecake out of the pan and onto a cutting board, cut into either 9, 12, or even 16 bars (depending on how hungry you’re feeling), + serve! Wow… I am in love. 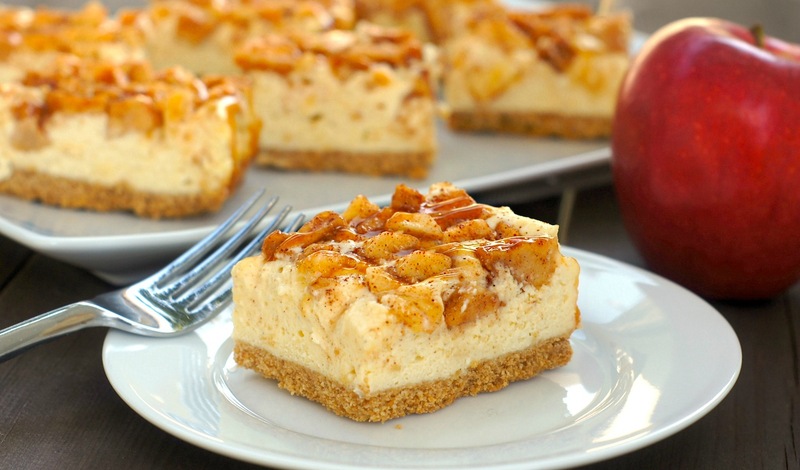 Cheesecake is one of my favorite desserts, and this apple version is perfect for Fall. It looks great! Oh my goodness these sound simply heavenly! Brilliant pic for SRC! This sounds fantastic – great choice! What an awesome combination of textures and flavors – such a perfect fall treat! I like how versatile this could be, on a dessert buffet perhaps? You had me at “dessert buffet,” Dorothy! these sound AND look amazing! great photos. These are so pretty!! And perfect for fall… yum yum! If someone had made this for me as a birthday cake for me today, I’d be so happy. My ultimate cheesecake. Unfortunately, I’m cooking again today and I’ve forgotten to make myself a cake. Those are gorgeous, and so are the photos! They sound delicious. I love this recipe. Creamy and still has the Fall spiciness. And, I use gala apples for everything. But in the squares is also such a great (not messy) way to serve cheesecake. What a wonderful addition to the Thanksgiving dessert table these would be!!! These look incredible! Caramel + apple is always a good combo. Add in the cheesecake factor and it’s insane! Insane in the “Diet? What diet?” kinda way. YUM! I’m a sucker for caramel apples and I love using those flavors in various baked goods. The combination of caramel apples and cheesecake…well, that’s just out of this world! oh this looks so good! love that the ingredient list is so simple for cheesecake. yum! The thicker the crust the better! These look absolutely perfect for fall. These bars are gorgeous and absolutely delicious. My husband would love the apple and cheesecake combination. Happy Reveal Day!! These bars look divine. I haven’t made an apple cheesecake. I may have to start with these bars. Nice pick! THESE LOOK AMAZING! I am all about caramel apple anything right now. Perfect pick this month. Happy Revel Day! 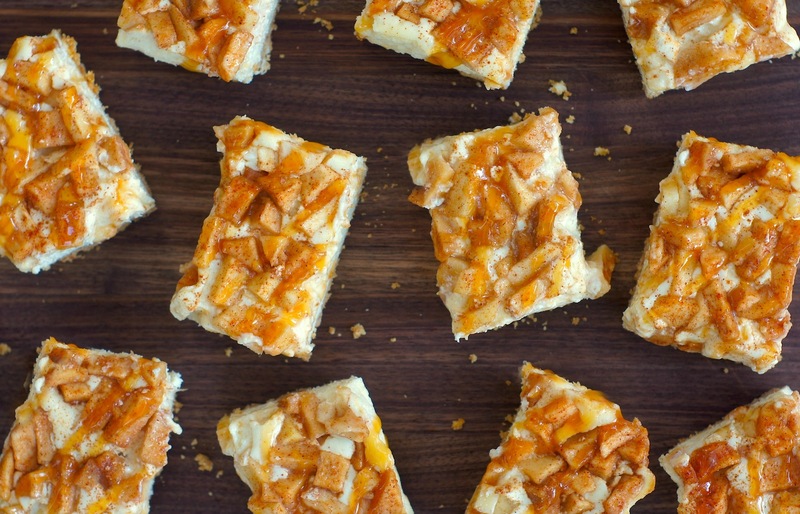 Caramel apples on top of cheesecake bars … sounds like a winning formula to me. They look so beautiful too. Great choice. I love that the apples are placed on top rather than baked inside the cheesecake, sounds delish! These look so yummy – perfect choice for fall! These bars look amazing, Amy! I love caramel apple anything and am a sucker for cheesecake. I love that you topped the apples on top too – so delicious! <3 them! Oh wow! These look so perfectly creamy and delicious! just perfect to brunch snacking…..
Wow! Those bars look so yummy. These bars look so good and so easy. Might have to make this around Thanksgiving time. The apple cheesecake bars would be a great dessert item on a Thanksgiving buffet that I’m invited to this month. Apples are wonderful with caramel – what an inspired fall dessert! These sound wonderful. I always enjoy your Secret Recipe Club. There are certainly a lot of talented people out there! Made this in a 10″ cheesecake form and it was delicious! Great Thanksgivings dessert! Hooray! I am so thrilled you liked it, and yes, it’s a perfect Thanksgiving dessert. =) Cheers! Made this, and my family absolutely loved it!